Similar to their other apps, on the first screen (featured left) the therapist can choose the option of customizing the app’s settings or viewing the informational video. Next add the child’s name and chose the flashcards or a fun board game mode. You can switch cueing methods on the same screen. You also record the child’s response by tapping on one of 3 available buttons on the screen: green check = correct, red x =incorrect, and yellow=approximated sound. Correct responses are rewarded by bees on a plant on the left side of screen. When the child acquires acertain # of bees s/he gets to play a puzzle game. If you chose the board game version then the child gets to choose a bee avatar on the left and then gets to the finish line by spinning a spinner. When the child lands on a lily pad a picture pops up and the child has to produce the desired syllable/word/phrase, etc. You can edit all targets (add/remove words based on child’s needs) as well as select the number of stimulus trials for each level. In addition to using existing photos and videos from this app, you can also add your own images and record your own videos to individualize your therapy sessions. I also really like the fact that in addition to hearing the presented syllables, words and phrases you can play a brief video for the child which shows the actual mouth production of the presented stimulus items. Currently you can find this app for $24.99 in the Itunes store. Want your own free copy? Then enter my Rafflecopter giveaway below for a chance to win! I would use this product with my elementary kids with apraxia. also many of my kids could benefit from this type of repetitive speech tasks to increase their speech fluency. We would use this app to help my two boys with their Apraxia. My youngest son was awarded an Ipad through Ipads for Apraxia and we are currently trying to get him some apps going to begin supplementing his speech therapy and to use as an augmentative device. He will be three in January. The close up of the mouth saying words will help him immensely. We often have to have him watch us say a word to give him a model and then he tries. The ability to hear the word and see how the mouth moves to say it is vital for him. This would be a great app to start him out on. The colorful images and such will help hold his attention for sure. I have several little ones that would love this app. I have a new student on my caseload who would really benefit from this app! It looks great, thank you for the review & giveaway! I would use this product with elementary students! I love how you can customize the difficulty and it also provides the student with visual and verbal models to help them produce the correct sound. You can start out very basic and build up once he or she masters the previous level! 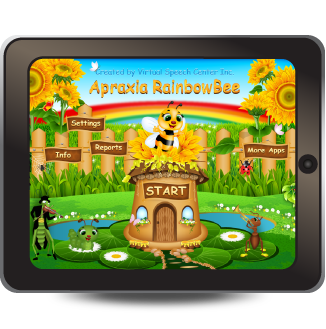 This is one of the better apraxia apps I have seen!